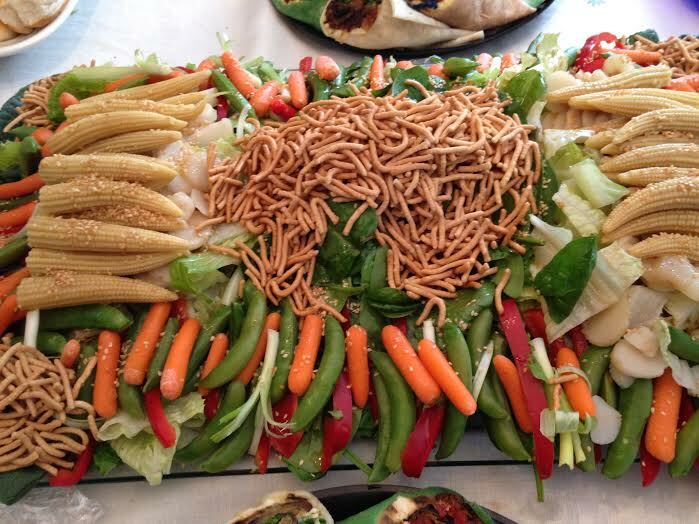 This is a salad I had at my friends party. She had it catered from Holten Brandi in Boston. Everyone loved it and I found the recipe on a television program. That was 35 years ago and I have been making it ever since. I have added a couple of things but it is still very similar. Mix all the dressing ingredients and shake well. This is a sweet dressing but very good on the salad. It also makes a delicious marinade for chicken or pork. Mix the spinach and lettuce together. Place this on the bottom of the tray. Decorate the top with the remaining ingredients except the sesame seeds and noodles. I can now make the entire salad ahead of time. Wrap it well and keep in the refrigerator till it is time to serve. Take off the wrap and add the noodles , sesame seeds and dressing. You can also add two pounds of shrimp or cooked chicken. When I serve this as a lunch I may add the protein but in a buffet I usually leave the protein out. Thank you Creativity in Catering and W.B.Z. T.V.